With two teams fighting it out on the field, fans yelling at the top of their lungs, and players adrenaline rushing. 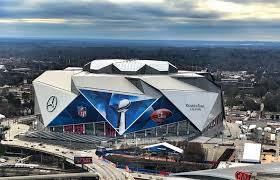 The Super Bowl happens once a year, moving around the country to a different stadium each time. Furthermore, the event is made up of two teams, the National and American football conference playing against each other. This year it’s the New England Patriots against the Los Angeles Rams. The Patriots have competed in a whopping ten Super Bowls winning an impressive five times. The Rams have only made it to the game twice and only brought home the title one time. “I think the New England Patriots will win this year because they are more successful and have more experienced players on the team,” Ashley Johnson said. The winning team will take home the cherished championship ring, worth more than $36,000 due to the gold and diamonds used and the ring’s prestige. The rings always include the teams’ logo, the trophy, and the words “World Champions”. This year’s tickets cost between $2,800 and $22,000. “In my opinion that is way too much money to watch a football game. So many people wish they could go but can’t because the cost is unreasonable,” Elizabeth Cargile said. Superbowl halftime shows are known for going over the top. They consist of musical artists who perform to entertain packed stadiums and millions of viewers around the country. Selected fans will have field access during the performance to belly up to the stage at the 50-yard line and watch the artists perform. The halftime show artist’s paychecks are capped at $10 million, and all expenses are paid by the NFL. Maroon 5 is being joined by Travis Scott and Big Boi and will be performing the halftime show this year. “I hope Maroon 5 sings Moves Like Jagger, Animals, Love Somebody, and Cold,” Holli Miller said. During the game, most fans go out to eat, have a party, eat food, and of course, watch the game. However, while restaurants and bars are packed with fans screaming, some families are running the low-profile version of the big game, relaxing in their home. “On Super Bowl, Sunday my family makes lots of different trays of food and invites friends and family to enjoy the game,” Brandon Edger said. Watching the game, having people over, or even buying the commemorative shirt can be a tradition that some families have followed for decades.